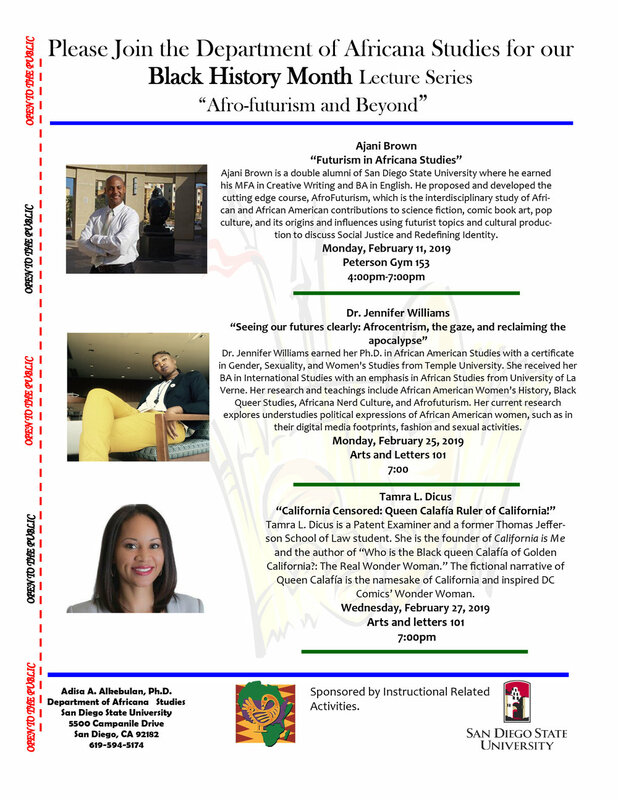 CALFORNIA IS ME thanks King Dr. Adisa Alkebulan, San Diego State University, for spreading California love for CALIFORNIA CENSORED. Started from the bottom, now we are spreading California Love, armed with knowledge pushing the educational, economic, and social justice agenda forward. Forever grateful to continue being a TJSL social problem solver and TU engineer. Slay! Click (here) for details at SDSU. 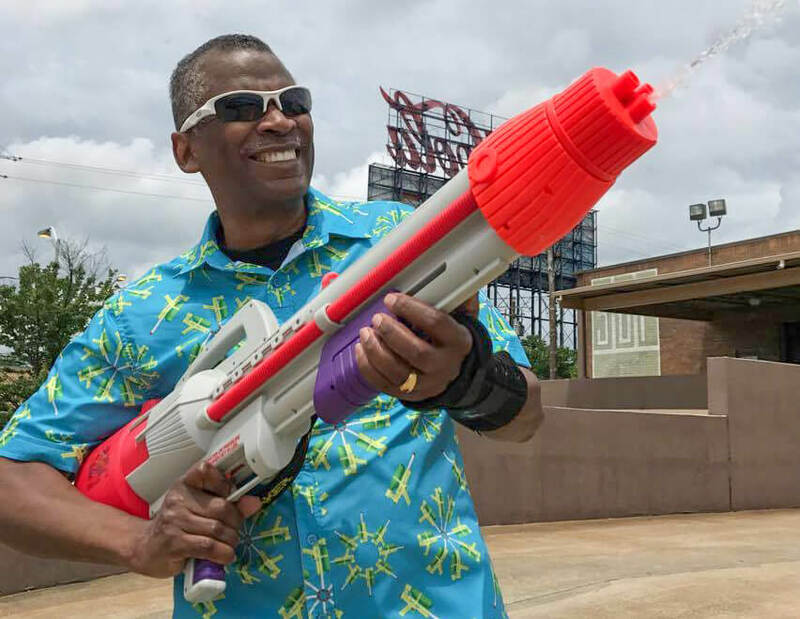 USPTO features King of Toys, Tuskgee University’s and Mobile, Alabama’s own, Mr. King Lonnie Johnson, inventor of the Super Soaker®! Heeyyy, Tuskegee! Knig Lonnie also successfully led the Nerf dart gun line. Read and listen to the interivew (here). Again, full circle moment for me. I first listened to him at Tuskegee University in the chapel when I was attending. He inspired me to keep perservering to attain my chemical engineering degree. Thank you, King Lonnie! 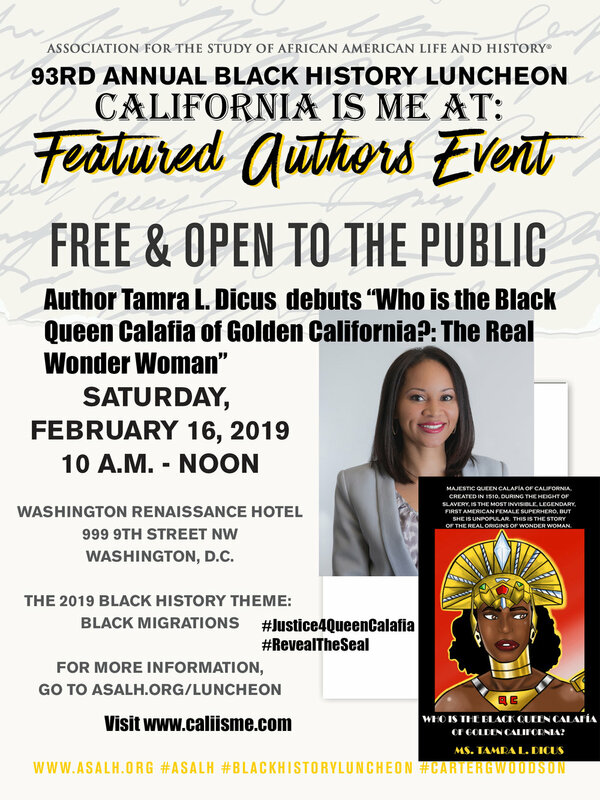 Celebrate New Black History in Black History Month at ASALH's Featured Authors Event, Washington, D.C.
Free CALIFORNIA IS ME EST. 1510 “Scepter Diva Pen” with purchase of autographed copies while supplies last. The pen is mightier than the sword! 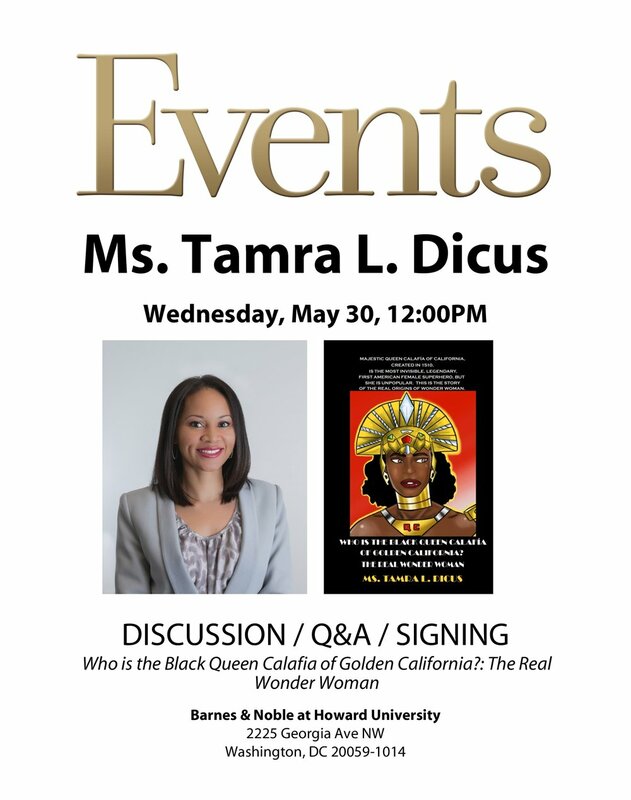 What: Super excited CALIFORNIA IS ME® is debuing author Ms. Tamra L Dicus’s Who is The Black Queen Calafia of Golden California? : The Real Wonder Woman (aka “new black history”) with the founders of Black History Month-the Association for the Study of African Life and History® (aka ASALH)! Place: Washington Renaissance Hotel • Washington, D.C.
Free ASALH’s Annual Luncheon Featured Authors Event details: ( click here for details). 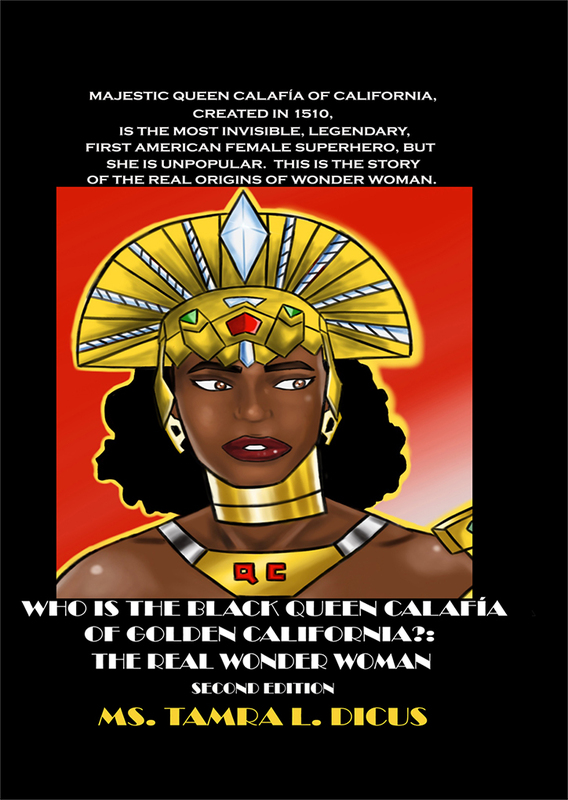 Click on The Making of Queen Calafia time lapse video! Special thanks to Georgetown Law student and artist, Daniel Bamber. 1st T.V. interview, ITCTV, Washington, D.C.: (here). 1st radio interview, WAOK, Atlanta, GA: (here). Slay Queens and Kings! Challenge your organizations to forward! For more media clips, visit media link: (here). Pass the Califorrnia Censored National Public Service Announcement: (here). 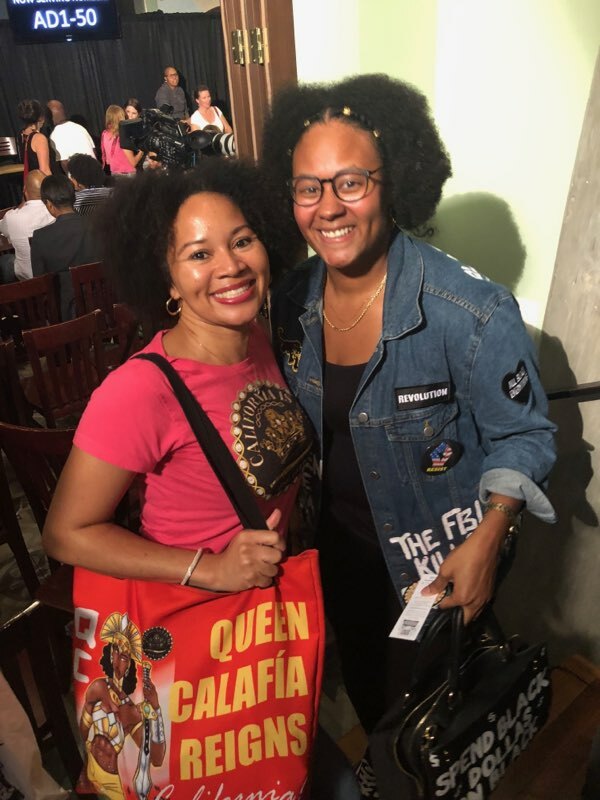 Queen Calafía’s finest: Queen Angela Davis, the baddest California warrior visited Washington D.C.
Super Saturday soars with tons of empowering quotes! 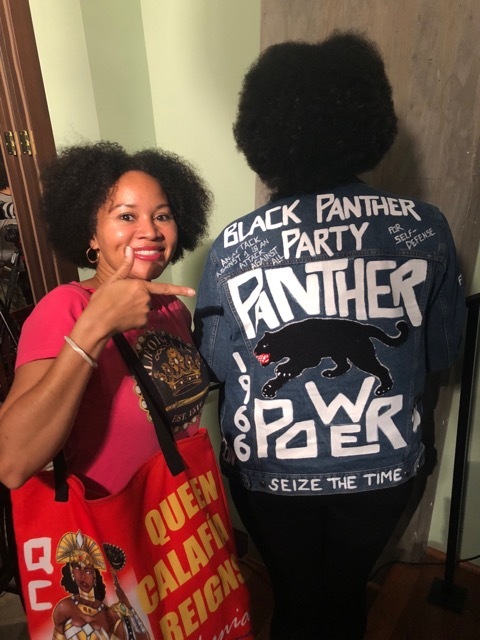 What an honor to meet Queen Calafía’s finest warrior and Oakland’s Black Panther—Angela Davis! 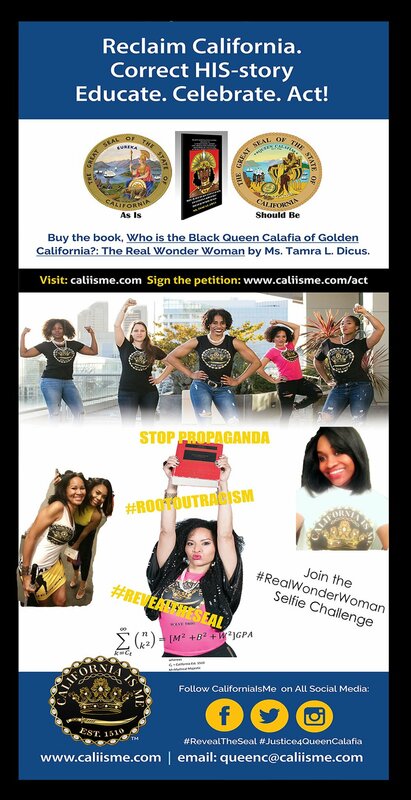 I empowered myself with the California Black Women Amazon warrior spirit, as I had my super CALIFORNIA IS ME EST. 1510™ tee-shirt on (Kanye, you’re not the only one with super powers), to fight the long lines wrapped around the corner in the rain. 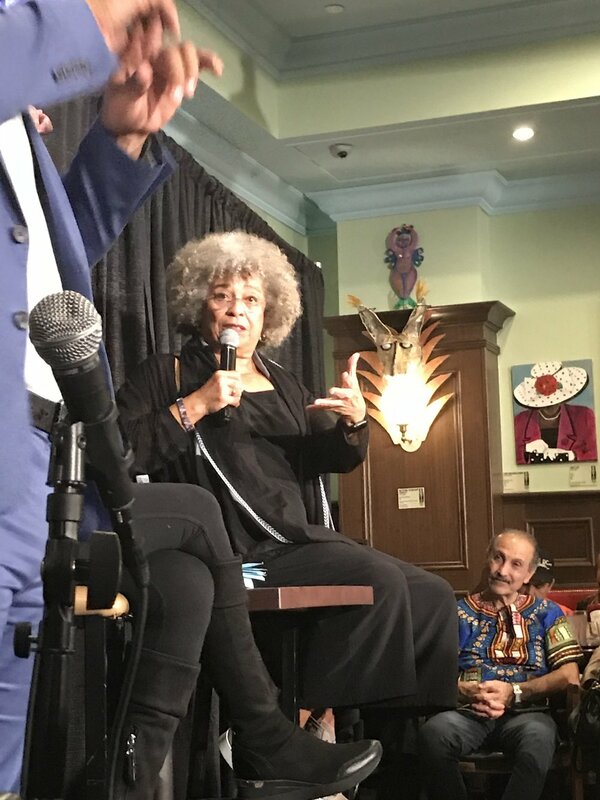 Queen Angela slayed this week, debuting her latest book, “Freedom is a Constant Struggle” at Busboys and Poets in D.C. to a pack filled room. Amy Goodman, television reporter at Democracy Now!, interviewed The Queen with poignant questions, stating how “history gets erased so quickly” and how Queen Aretha Franklin offered to post bail for Angel Davis. Queen Aretha, as told by Amy Goodman, stated, “[I] got the money from Black people and I want to use it to help Black people!... 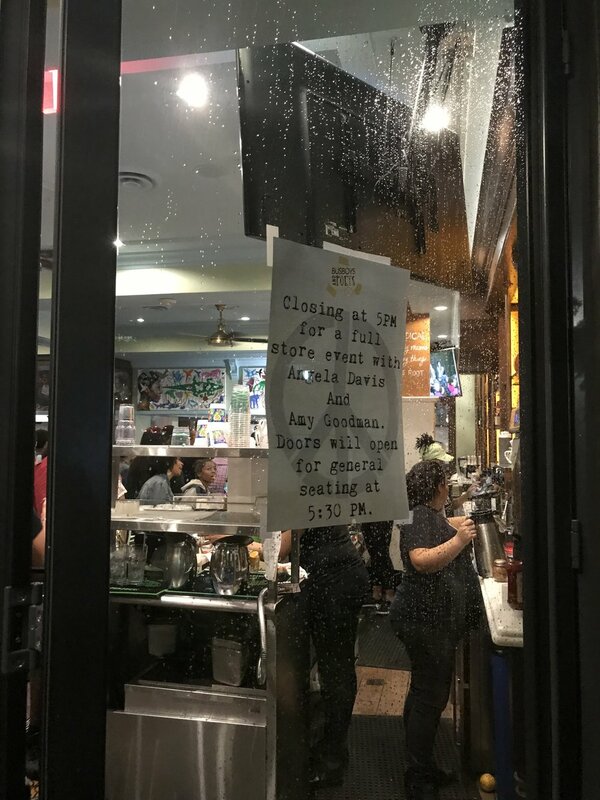 [A]ngela Davis must go free. Angela Davis will be free.” How apropos for California’s regal Black name to embrace such powerful Black women, true to its very name. One day California’s freedom from censorship will occur. 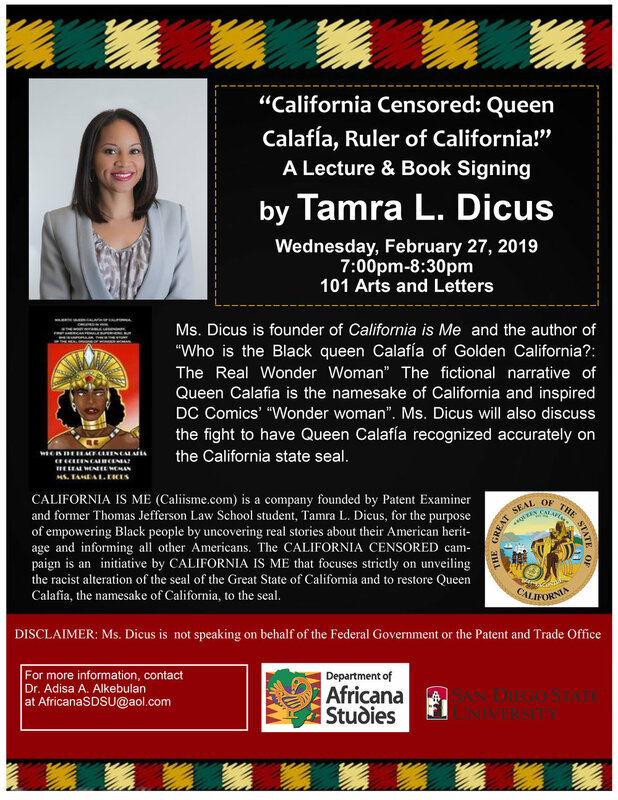 [sign the petition here] The freedom in the collective Black American intellectual property will ensure more Black women are Queens of California: Arethas, Angelas, Oprahs and their offspring are Kings of California: Malcolms, Martins, and Baracks. A true California warrior can only bounce back from three death penalties, being followed and fired from UCLA. Queen Angela expressed the need for hiring Black attorneys. Trust is the obvious reason. I was overwhelmed to joy and encouraged to listen to her transformative, survival American story to continue to eradicate racism. What an empowering, enlightening, and explosive night! Calafía’s California is back to reign! A transcript (may not be in its final form) of the event is as follows with a voice recording below. Angela Davis - It was “…1971. George was uh, was killed by uh, San Quentin guards. And umm it was during that period there was so much going on, uh that it was uh, we could hardly find the time to morn and to grieve because, you know, something else would happen…[T]hat period was so compressed…[I]’ll never forget when my uh, attorney Howard Moore and um my attorney Margret Burnum…[c]ame to visit me because at that particular time I was back in solitary confinement ‘cause I had been extradited to California…”. Angel Davis- “Well, yeah. I mean, why no-, I mean-why. The thing is, there was so many political prisoners during that period…[T]here were, there were really good attorneys…[B]ut, but there were also Black attorneys who were committed who had a history um in civil rights activism...”. Listen to more of the video clip (here). Buy Queen Angela Davis’ book (here). Read an article by the L.A. Free Press, 8/27/1971 (here) titled, “Angela Davis on George Jackson”. Remembering our ancestors, attend Barnes & Noble HU D.C. debut this Wednesday!